We’ll walk in any weather so come prepared for the rain and cold. If it your first time, please do give us a call on 07963 446605 to have more of a chat about what’s going to happen. Feedback people give after is often that they’d like more info about what to expect. So give me a call! Please bring some extra food to share . In May, we collected lime leaves to stuff. We picnicked in the new pond / frog area in Ruskin and had a tour of the Ruskin Park community garden. We made May baskets and discussed the EU ban on Medicinal herbs. 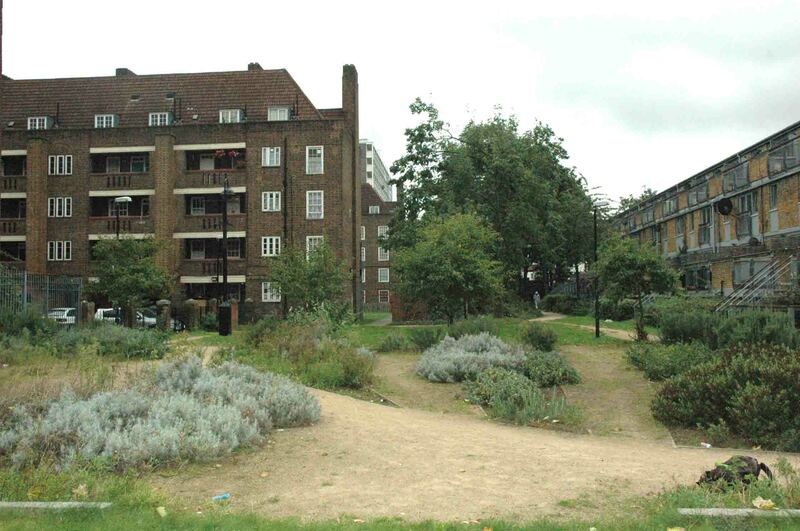 Walk on 20th February 2010 – Eritrean bread and goosegrass and chickweed curry! If we start at the Loughborough Centre, here are the directions to get there if you’re not from the nearby area. The aim of Invisible Food is to strengthen social cohesion in disadvantaged areas throughout Lambeth, and specifically on the Loughborough Estate, where the project is based, through engaging with the natural environment. Invisible Food walks and workshops aim to increase opportunities for BME groups to contribute their environmental knowledge and experience to the reskilling process that London communities are undertaking. Invisible Food organises wild food walks, cooking sessions and creative workshops as opportunities for sharing experience and strenghening communities. Invisible Food came out of a commission by arts organisation Artangel, to explore approaches to play. In the search or hunt for wild food, we enter into a spirit of play, of tracking down, of excitement or expectation. Looking for wild food alters our perception and the way we use our eyes. Other outcomes from playing this ‘game’ is an increased appreciation of our shared environment and where food comes from, as well as potential medicinal and culinary uses of plants. It can also impart a sense of well being and satisfaction from the self-sufficiency of finding and cooking food, not using packaging or needing to go to the supermarket. What skills can be learnt? Photos by B, taken on 23rd July. I don’t think the plant that says it’s chickweed is chickweed. Thanks for sending photos on, B! I go around the country filming foragers, and writing of my own foraging antics down here in Devon. If you’re up for it and when I’m next in London maybe I could come and film one of your wild food events. What says you? Keep up the food activism, we need folk like you to keep spreading the word. I would like to ask you all if you think is good idea to eat all this free food found around the centre of London. I recon, there are too much pollution that can make food containing unhealthy substances causing illness to people and animals. If you haven’t tried it yet, please do. You’ll love it. RE: Polution. Stuff next to roads, and especially busy roads, is usually avoided for good reason. Old industrial land can be contaminated, so it’s good to ask around. Just come along on a walk and chat with people about what’s good and where. We are a Group of students, from the university of London College of Communication, department of the MA Interactive Media. Our project is to approach a community like you and detect any needs you might have in order to create the right tool for you. Please give us the opportunity to help you, and help us create a sustainable interactive tool proposal for you. In case you are interested, the only thing we ask is less than 30 minutes with you in order to learn more about what you need. Please contact me, as soon as possible, in order to arrange a meeting or leave your contact details so i can reach you. or even this weekend at your preferable time and location. This sounds like a great opportunity to increase well being as well as getting us to recognise and learn about wild food and how you can use it.